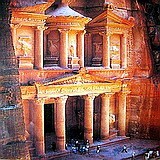 Don’t miss amazing Petra in Jordan, ancient Nabateans city on Frankincense & Myrrh Spice Route. Easiest access is from Eilat, Israel on the Red Sea. Ask Zack Shavin how! The Treasury at Petra is carved out of Red sandstone. 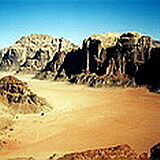 Petra (“stone” in Greek) is situated in southern Jordan- Edom of bible times. Petra was carved out of red sandstone by the Nabateans some 2000 years ago, and controlled the Spice Route plied by camel caravans between southern Arabia and the Mediterranean, with its lucrative frankincense & myrrh trade. This wonderland of temples, tombs, and elaborate buildings is one of the Wonders of the World and a UNESCO World Heritage. Pickup after breakfast from your Red Sea hotel in Eilat, for a short drive to the Israel Jordan border crossing. Scenic drive to Petra through the red saw toothed mountains and colorful sandstone landscape of southern Jordan- biblical Edom. We reach the Siq, a narrow passage through the mountains, opening out to the breath-taking Treasury of Petra. Visit the numerous monumental rock-carved structures. Following lunch, visit the Spring of Moses & Red Sea port town of Aqaba (time permitting). Cross back into Israel. DAY 1- Cross from Israel into Jordan for a jeep tour of spectacular & colorful Wadi Rum, in the footsteps of Lawrence of Arabia. Continue to Petra for dinner & overnight. DAY 2- Visit Petra: Narrow Siq passage opening into the famous Treasury and the numerous monumental rock-carved structures. After lunch continue to the Spring of Moses & Red Sea port town of Aqaba (time permitting) before crossing back into Israel. 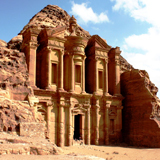 Want more info about how to easily visit Petra or include it in your Israel tour? Contact Zack Shavin, veteran guide & biblical archaeologist at Land of Israel Tours.